I used to be a lifeguard in Laguna beach. It was on one of the gnarliest beaches on the planet, Aliso. This was back before being in Laguna got you a spot on T.V. Almost did it as my career. Fast forward to this morning. I was out surfing with Deuces in Cardiff. We were on our way out, and I spotted this little thing bobbing in a rip. A rip is short for rip tide. This is when the water piles up close to shore from the waves bringing water in, and the water flows out like a river. It can travel as fast 10 miles per hour or so, often much faster than you can swim. Well, as I got closer, I realized it was a little girl in the rip. I got up about 10 feet away, not wanting to scare her, and asked her quietly, “Would you like to grab the end of my surfboard and have me pull you in.” She was totally chill, and said yes and nodded her head up and down. Over the years, I personally have developed a bit of fear (sometimes downright strong fear) of being out far in the ocean. I was a bit further out than my comfort zone and now I had her as my responsibility too. I started slowly toward shore, pulling her with me. At one point, her mom made it out to where we were. As we hit the zone where the waves were breaking I grabbed onto the little girls arm, and a few waves crashed on us. Oddly enough, just as I was getting to dry sand, the lifeguards were coming on duty. Mom was a little concerned, girl was totally chill. 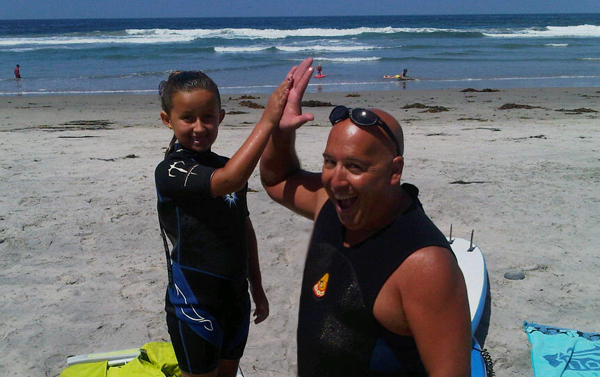 I made sure to tell the little girl how great she did in the waves, and how relaxed she was. I didn’t want her to start getting scared of the ocean, she just needs a little more training. Fun first rescue of the summer. 🙂 I am sure there will be more. DK, you are one pretty awesome dude. What Al said! I know that feeling of the open water, I don’t like salt water at the best of times and I really don’t like it when my feet can’t touch the bottom. I was a near Olympic standard swimmer, swam 6 miles a day but have a lot of respect for the sea, and even more respect for you, the hero of the hour!